John Mellencamp Biography, Discography, Music News on 100 XR - The Net's #1 Rock Station!!! Born October 7, 1951 in small Southern Indiana town of Seymour, USA, Mellencamp became one of the America's most successful Heartland-Rock singers of the past two decades. He began his career in the mid-'70s; Mellencamp's name was changed to Johnny Cougar and in 1976 he moved to New York City where recorded his debut album, "Chestnut Street Incident" which came out on MainMan Records. After the record failed to gain any attention the singer moved back to Indiana releasing "The Kid Inside", just a year later. In 1978 he signed with Riva Records who released "A Biography" before the year's end and 1979's "John Cougar" which generated his first American top 40 hit, "I Need A Lover", its success propelled the eponymous effort to #64 on the U.S. Pop Albums chart. "Nothing Matters And What If It Did", his next release, arrived in 1980, reaching the #37 position on the U.S. Top 200 LPs & Tapes chart and spawning two top 40 hits including the #17 "Ain't Even Done With The Night" and "This Time". Two years later, John Cougar's breakthrough LP, "American Fool", peaked at #1 in U.S. while "Jack And Diane" hit #1 on the Pop Singles chart, this was his biggest hit in the U.K. peaking at #25; he even snagged another U.S. top 3 smash, "Hurts So Good" which also topped the Mainstream Rock chart and won him a Grammy for Best Male Rock Vocal Performance; the final single, "Hand To Hold On To", entered the top 20 of the Pop Singles list. After the enormous success of the million-seller "American Fool", John Cougar reclaimed his actual last name, Mellencamp, for the follow-up, 1983's "Uh-Huh"; John Cougar Mellencamp's first album climbed into the top 10 of the U.S. Pop chart highlighted by the Mainstream Rock top 3 hit "Crumblin' Down" which also peaked at #9 on the Pop Sales chart; it was followed by "Pink Houses" and "Authority Song", both debuted on The Billboard Hot 100 reaching the #8 and #15 spots respectively. Two years later the heartland rocker's eighth outing "Scarecrow", soared to #2 on The Billboard Top 200 chart spawning an endless stream of album-Rock staples which helped pump album sales to triple-platinum, "R.O.C.K. In The U.S.A." peaked at #2 on The Billboard Hot 100, both "Small Town" and "Lonely Ol' Night" rose to the #6 spots on the same chart, all of those singles also charted in The Mainstream Rock list hitting #6, #2 and #1, respectively; "Rumbleseat" which cracked the top 30 of The Billboard Hot 100 in 1986 was another Rock radio smash reaching #4, "Minutes To Memories", "Rain On The Scarecrow" and even the B-side of "R.O.C.K. In The U.S.A.", a folksy version of The Drifters' "Under The Boardwalk", continued to make an impact at Mainstream Rock stations storming the top 20 of the Billboard chart. Many of Mellencamp's songs were now dealing with social problems and he was one of the organisers of the first Farm Aid, a benefit concert for the United States' beleaguered family farms that raised the public's awareness of the issue. 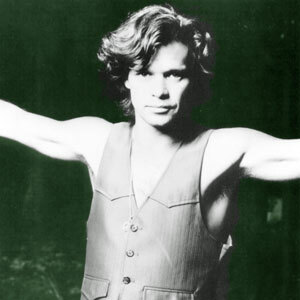 1987's "The Lonesome Jubilee" was the first album credited to John Mellencamp, his ninth effort peaked at #6 on The Billboard 200 and yielded two Mainstream Rock #1 singles: "Cherry Bomb" and "Paper In Fire"; both songs also crossed over to become top 10 of The Billboard Hot 100; four more Mainstream Rock top 10 hits followed including the #3s "Check It Out" and "The Real Life", the others were "Rooty Toot Toot" and "Hard Times For An Honest Man". The next year, Mellencamp scored another Mainstream Rock top 20 hit when he recorded "Rave On" for the soundtrack of the film "Cocktail". In May 1989 he released "Big Daddy" which debuted at #7 on The Billboard Top 200 Albums chart, its main single, "Pop Singer" peaked at #2 on The Mainstream Rock chart and broke onto The Billboard Hot 100 at #15; the follow-up single, "Martha Say", hit #8 on Billboard's Active Rock list and "Jackie Brown" inched into the top 20 on the same chart. Another two an a half years passed before he released "Whenever We Wanted", despite the album missed the top 10, landing at #17 on the U.S. Sales chart, it contained four Mainstream Rock top 5 hits, including two #1s "Get A Leg Up" and "Again Tonight" plus "Now More Than Ever", "Love And Happiness" and eventually the fifth single cut, "Last Chance", reached the #12 position on the same chart. 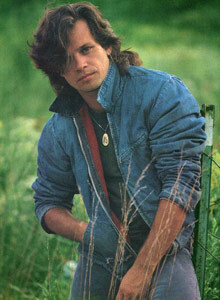 In 1992 John Mellencamp directed and starred in the movie "Falling From Grace". The following year he returned with his twelfth LP, "Human Wheels", the record went straight into the top 10 of The Billboard 200, while two singles, "What If I Came Knocking" and "Human Wheels", climbed the Active Rock chart eventually hitting the #1 and #2 spots, respectively. In the summer of 1994 the Indiana singer+songwriter released "Dance Naked" which reached #13 in U.S. backed by a duet with funk diva bassist Me'Shell NdegeOcello on classic freedom song "Wild Night", the track hit #3 on The Billboard Hot 100 and #17 on The Mainstream Rock chart; the second single, the album's title-cut reached #21 on the Active Rock chart. 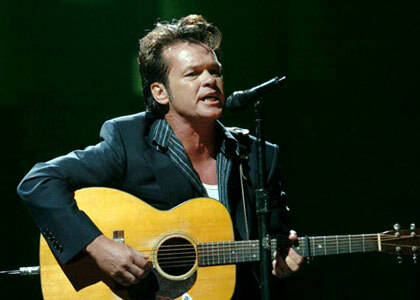 Shortly after the release of "Dance Naked", Mellencamp suffered a major heart attack that forced him to take a two-year leave from the scene. He continued writing and recording steadily, resurfacing in September 1996 with "Mr. Happy Go Lucky", this album peaked at #9 on The Billboard Top 200 chart as well as received a gold certification in the U.S. helped by the single "Key West Intermezzo (I Saw You First)", which hit the top 10 of The Mainstream Rock chart and debuted at #14 on The Billboard Hot 100; the follow-up single, "Just Another Day", peaked at #13 on the Billboard's Active Rock chart. In 1997 John Mellencamp split from Mercury Records after a long-time relationship and no less than five platinum albums. The following year he signed to Columbia who issued his next album; the eponymously-titled LP, on which he experimented by adding exotic flavors, came out in October 1998, the day before his 47th birthday; the record spawned two mid-sized hits in the Mainstream Rock top 40: "I'm Not Running Anymore" and "Your Life Is Now". Three years later Mellencamp released "Cuttin' Heads" which reached the #15 position on The Billboard Top 200 Albums chart and the main single, "Peaceful World", stormed the American Adult Contemporary charts. In 2003, his first covers album, "Trouble No More", shot to #1 on Top Blues Albums and reached #31 on The Billboard 200 charts. A year later Mellencamp released "Words & Music John Mellencamp's Greatest Hits" a two-disc set which featured all of his charting hits and a previously unreleased track, the Adult Top 40 hit "Walk Tall". John Mellencamp issued, "Freedom's Road", his first full album of new material in almost six years, in January 2007; he prefaced this release licensing one of its songs, "Our Country", for use in a TV commercial for a truck. The broad exposure for the brief excerpt from the song helped give him his first singles chart entry in eight years, a one-week appearance on The Billboard Hot 100 at #88; instead "Freedom's Road" flew up The Billboard Top 200 Albums chart to #5. His eagerly anticipated new album, "Life Death Love And Freedom", produced by T Bone Burnett, was released in July 2008. The album is the very first ever release employing the XOAE (CODE) format, developed by Burnett and his team, offering high resolution audio playable through any DVD player. The first single from Mellencamp's new album is the track "My Sweet Love".